Hi, guys! In Part 1 of this master closet makeover I shared the nightmare that catapulted this dreamy master closet into reality. After clearing out the entire closet and assessing all options, it was time to dream up a plan that would maximize the space in my closet. I started to sketch out a plan according what I wanted and what I thought I could fit into the space. A little tip for you here: Something I like to do with all of my projects to keep me on track and ready when the opportunity strikes is to always have a special notebook (actually a journal I picked up at HomeGoods) with me. I like to keep all of my measurements and sketches, and any other information I need to remember about a space, in this notebook. As I draw and dream up spaces in my home, I write the measurements of the spaces and any paint/decor ideas that I am thinking of doing. this nail puller and remove the nails from the board. It is also called an End Cutter. GENTLY pull the front of the nail through the back, don’t try to push the nail through to the front. It is just easier to remove that way. Again, be gentle with your grip. If you clamp too hard on the tool, you will cut the nail and then you won’t be able to get it out very easily or even at all. After all of the baseboards are removed, go ahead and run a putty knife where the caulk was on the wall to remove the leftover caulk from the wall to make it smooth again. It will make it a lot easier and cleaner to caulk the baseboard once it has been reinstalled. The next thing I did was tape off the measurement of the cabinets I was going to build so I could see the way that it would all fit together in the space. TIP** If you are going to build or even just install tall cabinets, take some large boxes and place them in the space to see how it will feel to have cabinets actually in that space. ** In my case, I had limited width in the closet so I had to tape the measurements to be sure that I had enough space to walk around. After I taped all of the footprints to the measurements of the cabinets I was going to build, I used my box cutter to cut the carpet away. I cut where the tape was to expose the subfloor and create a flat surface for the base to be built upon. I cut away enough to expose the subfloor but left enough to be able to fold it under and reattach it to the tack strips. If you’re doing it right, you don’t want to just place the base on carpet because you want it to be level. That is most important. 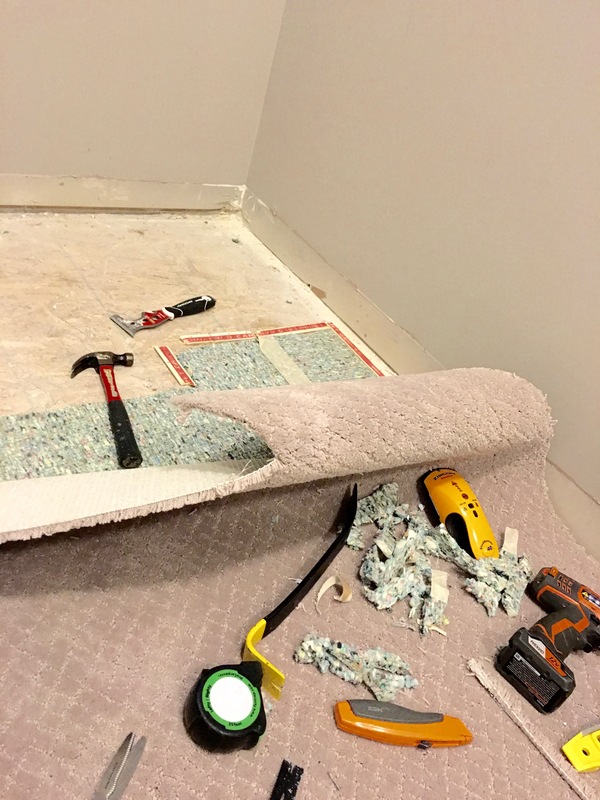 I then removed the tack strips (the nail strips that keep the carpet down) in the area and I kept them so that I could reuse them. Sharp little buggers…wear gloves for this part. Some would say I am cheap, I say that I am good at not creating waste. I also cut and removed the padding in the area, too. (That I did NOT keep!) You may also see that I did a little sketching on the wall. It was going to be covered anyway by cabinets so I felt free to do this. In the end I had all of these exposed subfloor areas where I planned to build all of the new cabinets. Yes….I was terrified to cut the carpet and afraid to make a mistake. I had never done it before and I was afraid that I would mess everything up!! And fear is what keeps us from doing the hard things #amiright. When I am doing these projects I always think, “what is the worst that could happen? I will have to call someone in if I mess it all up.” But I HAVE to try! What has FEAR been keeping YOU from doing??? In Part 3 I will start to share the build. OMG…it was so exciting to see what I drew on paper come to life! More to come…so stay tuned! Subscribe in the sidebar of this post to be notified when I post part 3 so you can follow along and you don’t miss a thing!